Along Route 6, Bradford County, Pennsylvania, between West Burlington, one can see an old grave yard and church on the side of a hill. A local resident or frequent traveler would hardly notice. Oh, he might say,” Yes, I have been there”, or “ I must stop some time”. A tourist passing along route 6, may never notice this sacred place, for no mention is made in the tourist guide or a place given on the road map. Only a small historical marker along the road gives any clue to the traveler that this historical church exists. Yes, one must pause from the every day living to get perspective of what we are doing. Like a carpenter stepping back to observe the progress of his building, an artist pausing to observe his painting or a Christian returning to his Bible for guidance. Presiding Elder C.C. Wilbur, surely paused at the Old Church, for in his annual remarks to the Central New York Conference at Ithaca, New York, in 1893 Elder Wilbur said,” On the Old Burlington Circuit, there stands the ancient church, built in 1822 with it’s high old fashioned pulpit, and all carefully preserved as a sacred relic of the past”. Rev. Owen Barrett, a long time Methodist minister of local churches, has often paused at the Old Church. He has served as host pastor, as a guest speaker, and as an authority of local history. He often speaks of how our Christian heritage came from the faith and labor of these early settlers, whose first thoughts were prayer and thanksgiving to God. Their faith in this land sustained them as they went from this Old Church to build and support other churches, even though the hard times of the Civil War. Surely the Old Church is the “ Mother Church” for Methodism in this northern section of Pennsylvania. To one’s mind comes the hymn, “ I love to tell the story, ‘tis pleasant to repeat what seems each time I tell it , more wonderfully sweet, I love to tell the story, for some have never heard----”. Clement Heverly in his History and Geography of Bradford County wrote: “ There is evidence that nations rose and fell ----, but no pen recorded their deeds”. Our knowledge of these people starts at a very late date when “ The American Indians” had taken over the land. It was about the year of 1615, five years before the pilgrims came, that Steven Brule was the first man to visit Pennsylvania, along the Susquehanna. He found that the Susquehannocks, consisting of ten tribes, occupied the Susquehanna Valley, with the northern gateway to their domain near the village of South Waverly, Pa. Then the Five Nations or Iroquois ( name given by the French) consisting of Mohawks, Oneidas, Onondagas, Cayuga’s and Seneca’s, became a great power and drove out the Susquehannocks. Later the five Nations sold the lands to the Whites. Then other tribes came to take asylum in this land such as: the Delaware’s, Mohegan’s, Monsey’s, Nanticoke’s, Shawnees, Tuscaroras, Tupelos, and other tribes. These Indians had a great influence on the early settlers’ culture, such as the paths through the wilderness, which later became roads; also the names given to our streams and villages. These are all stories by themselves, but our destiny was being made in Europe. In the year 1620, King James 1 incorporated the “ Grand Council of Plymouth for planting and governing New England in America, and granted to the persons constituting it, all that tract of North America lying between the 40 th and 48th degrees of north latitude, in it’s whole extent from “sea to sea”. In 1631 a deed from the Earl of Warwick of the Plymouth Council, conveyed to Viscount Say-and-Seal, Lord Brooke, and their associates, that part of New England, afterwards purchased from them by the Colony of Connecticut. In 1662 King Charles II renewed and confirmed the Charter of Connecticut. The territory, as thus described, included land bounded on the north by the south line of the Massachusetts grant, on the south by the 41st parallel of latitude, and on the west by the Pacific Ocean. That part which included Bradford County was within the Connecticut Claim. In 1681, King Charles II of England, granted William Penn, his heirs and assigns, all that tract of land in America, etc, etc.-. This grant overlapped that of Connecticut. So this “ overlap” became the cause of endless litigation and strife which lasted for more than a century. In 1737 Conrad Weiser was sent to mediate between the Six Nations and Southern Indians. He came up the Lycoming with Staffil Stump and an Indian Guide. Then down Sugar Creek ( they must have passed near the place where the Old Church now stands) arriving at the Indian village of Oscalui ( North Towanda). Weiser again met with the six nations ( 1743) to formulate a treaty in regard to disputed lands. By 1770, settlements were being made in Bradford County, along the Susquehanna River. Some came under the Connecticut title, some under the Pennsylvania title, a few had purchased land from the Indians, while others were merely “ Squatters". As a result of the questionable title to be land, the Pennanite and Yankee wars started. At this time there were about sixty families residing along the river in the “ Great Wilderness>“ this was the setting when the declaration was made, “ That the United Colonies are absolved from all allegiance to the British Crown. ”During the Revolutionary War, men responded to the call and gave service to this country. Families moved back to Wyoming for protection, others returned to New England and joined the American Army, while the Tories went to join the British lines. So nearly everybody left the bounds of the county. It was only after General John Sullivan’s expedition up the Susquehanna, those settlers began to return to what is now Bradford County. This section had changed from Northampton County to Northumberland County to Luzerne County. Anyhow, in 1790 Isaac DeWitt, Abraham DeWitt and James McKean came down from Johnny Cake Hollow ( Chemung, New York), and explored the wilds of Sugar Creek Valley. They met with the Indian, Tomjack, then on to look over the surrounding wilderness and liked what they saw. 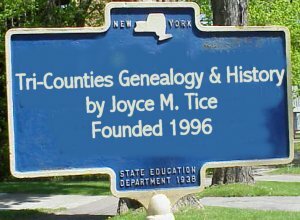 Although they traveled up Sugar Creek as far as what is now East Troy, they came back and built a hut on the McKean selection near the present County Manor. This was the first white man’s clearing on Sugar Creek. They spent the summer there, and with the help of Tomjack, they raised a good crop. These crops, along with the wild fruits, were taken to their families. Soon the news became known to the people at Sheshequin; as a force cut out a road from the river to the new settlement. The same road that is now used from Ulster to Burlington. After spending the winter at Johnny Cake Hollow, the Dobbins Family, along with the DeWitts and McKean families, made the trip in April to the new settlement. The women on horse back came overland, while the men took provisions on a raft down the river. They were to meet at the mouth of the creek. The raft was delayed so the women had to wait for nearly a week. Finally the raft arrived, and all the families were safe in the McKean cabin. Two years later (1798) an organization was formed call the Loyalsock circuit, Northumberland District, Baltimore Conference. Mr. Newman, a missionary from Baltimore Conference had already preached at the Old Church. His circuit covered Muncy, Sugar Creek, and Sheshequin. Later Jacob Gruber was sent as an associate to Mr. Newman. The hardships of these circuit riders, traveling on horses, in all kinds of weather, in summer and winter, are a story by itself. In 1799 the little settlement met with misfortune, the log church burned, but the people immediately began to build another. This second church, completed in 1800 was a vast improvement. 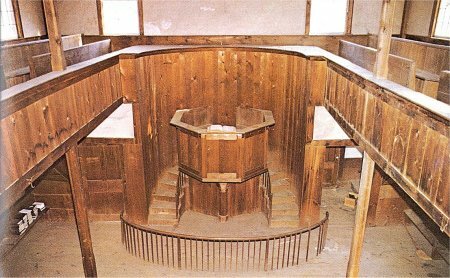 Hewed logs were used, a ceiling was built, a pulpit placed in the church, and a long double desk down the center for the school children. It was in this church that the famous Lorenzo Dow came to preach and “ To save Souls from Hell fire. ”By the year 1812, Bradford County was formed as we know it. Two years later (1814) a Rev. Ripley is mentioned as being in Burlington to preach. Perhaps, if one may conjecture, Mr. Ripley influenced the settlement to build new church; for the people tore down the hewed log church and built the present one in the year 1822. This was well built with the true simplicity of the time according to Disciplinary Rule.” “Let all our churches be plain and decent; But not more expensive than is absolutely unavoidable; otherwise the necessity of raising money will make rich men necessary to us, and governed by them, and then farewell to Methodist discipline, if not doctrine too." William McKean, a grandson of James McKean Sr., built the beautiful “wine glass” pulpit. More properly called by the Methodist of that time an “Octagonal Pulpit”, symbolizing the eight beatitudes of Jesus to the eight offices of the ministry. The Rev. David Croft in his History of Bradford County, writes concerning the preaching at this time: the visit of the circuit preachers were infrequent, it being a six week circuit with but two men to fill it. But this load was ably supplemented by local preaching: Phillip, Packard, Wilcox, Elisha Cole and others from Towanda Creek, and Lewis from Sullivan. The main burden fell on John McKean for 40 years. Aside from him, Elisha Cole was the main help of the Burlington Church. In the year 1833, the Old Church was incorporated under the name of First Methodist Church of Burlington, and eight years later (1841) the title to the land and church from Sam McKean, to the First Methodist Church of Burlington, was transferred and recorded at the Court House. One can surely feel that Samuel McKean had a warm place in his heart for the Old Church and for his parents. A marker was placed in the cemetery by Samuel in honor of his father and mother. Other preachers mentioned as being at Burlington, were: Luther Northway in 1844, John H. Day appointed to the historical Loyalsock circuit in 1845, and Rev. Lewis Rogers served in 1848. The year 1854 marked the beginning of the end for the Old Church, as far as an active church was concerned. The interest of the people was turning to other centers. The village of “ Burlington Corners” had been growing through out the years. During the years 1798-99, the first public road from Towanda to Troy passed through Burlington. About 1820 the famous Berwick Turnpike passed North and South intersecting the Troy road. “Burlington Corners” had already become a center with it’s stores, blacksmith shop, hotel, school, and post office. A union church was formed ; thus a large number of the membership left the Old Church. Also, Burlington was incorporated as a borough in 1854. Therefore, it comes as no surprise to learn that three years later ( 1857), plans were being made to build a church at West Burlington. In 1855 West Burlington Township was formed from the western part of Burlington. A village had already been established at the intersection of the roads west of where the Old Church stands. There was a store, hotel, blacksmith shop, grist mill, and post office. A church was needed. By the year 1858 with the help of Rev. S. Nichols and the good citizens of West Burlington, a church was built and dedicated. An account of this is given in the booklet, prepared for the one hundredth anniversary, of the West Burlington Methodist Church. The usefulness of the Old Church had been served, and the Rev. Nichols was the last minister with regular services at the church. Rev Owen Barrett believes that the Universalists met at the Old Church for a brief time, and according to a notice given in the 1864 Bradford Argus, by the Bradford County Sunday School Missionary Association, a Sunday School was organized at the Old Church in Burlington. Again Rev. Barrett, in response to our question about this notice, said that Sunday School organizations were formed where ever there was a group of children to be taught; thus in homes, schools, or abandoned churches. This association was non-denominational and often did not hold meetings in an active church. As one walks about the grave yard, the names of McKean, Ballard, Bloom, Perry, Whitehead, Brownson, Hill and many others may be seen. Walk into the sanctuary and one becomes enthralled. Time is turned back. This is “ The way it was, and you are there,” In the early days an anniversary meeting was held for two full days, starting on Saturday and continuing through Sunday. Laura Spencer of Bournes Mill said that she can remember well attending these meetings as a girl. The District Superintendent, Stanford, came to their home by horse and buggy to stay all night. The ministers from Burlington and West Burlington were host. The District Superintendent preached, as well as guest preachers, most of whom were former preachers from Burlington or West Burlington. The church was full and people were outdoors, listening through the open windows. Horses were hitched along the road, on the church grounds, and in back of the church. Families brought their picnic baskets, and a picnic was held on the grounds during the noon hour. Through- out the years, attendance and interest would wane, and then a revival would come about, bringing a new interest. Also, automobiles were soon to replace horse and buggy. The credit for keeping interest through all the years may be given to the McKean and Spencer families. In the last few years, Raymond and Henry McKean deserve great praise. In 1922, interest was again very high, with the church filled to over flowing. Rev. R.H. VanScoy was at West Burlington and Rev. C.W. Carter at Burlington. During the years one remembers Durbin McKean family, Lee Bourne’s, the Perry brothers, the Campbell’s, Pierces, Darrows, Whitehead’s, the Ross’s, yes and Al Meade and his wife always sat in the balcony, leaning over to survey all that was happening, along with the many other families. The children loved to be up in the balcony, or perhaps, the luxury of playing outside. Many of these people have gone, but others are carrying on the work. The meetings would start with a testimony meeting, each giving thanks and praise to the Lord. Then came the love feast. The main service would follow with the sermon given by the Superintendent of the Elmira District, for the Burlington’s were in the central New York Conference at that time. Of course a picnic lunch would be held by the various families during the noon hour. Each family had a special spot, and returned to it each year for their annual Old Church gathering. The afternoon meeting would start, by the Old Church committee; and any business of the time would be taken up, followed by a historical report, perhaps by Judge A.C. Fanning, or Rev. Owen Barrett, and now by Raymond McKean. The afternoon service would be held with perhaps a former minister of either charge giving the sermon. The evening service would be held one year at the Burlington Church, the next year at the West Burlington Church. The singing of old hymns still rings through out the valley. The meeting day is over, but one steps back and takes a long look at the church and the church yard. The interior of the Old Church is very plain. The aged native pine, untouched by paint, and the plain plastered walls and ceiling, seem to enhance the beauty as the years go by. Between the two front entrances, stands the high pulpit with it’s winding stairs. This pulpit can readily be seen from either main floor or the balcony. The pews are made of plain straight boards with a divider down the center. There is a wooden bench along each side and across the back. The U shaped balcony has two rows of pews on each side and five rows in the back. The many paned windows cast plenty of light on the church interior. How have they been able to keep the building and yard so well all these years? By the faithful few. There was a time when it was impossible to get anyone to completely mow the yard. Brush grew so thick that many graves could not be seen. Here again the McKean family, with other volunteers, cleared the brush, and once again the place looked respectable. The old wooden shingles gave out and steel roofing was used to replace them a number of years ago. In the 1950’s the church was given a coat of white paint, under the direction of Theodore Wrisley, and the help of volunteers. Again in the 1960’s, under the supervision of Theodore Wrisley, and the help of the McKean family, the floor was taken up and new floor joist were put in. What original floor could be placed back was done, new flooring was used where necessary. This was the first time any major repairs were ever made.. In 1976 major repairs were made such as painting the church on the outside, the repair of a broken support to the balcony, improvement of the blinds and windows, and what ever work necessary to keep the Sanctuary in good repair. Where does the money for maintenance come from? The collections and donations. Where else do Methodist get money? There have been very few records kept of the annual meetings. Bradsby’s History of 1891 list trustees of the Old Church as: C.Rockwell, J. Blackwell, Jesse McKean, George Hill, Sherman Hill, Mr. Whitehead, Isaac Brown, Mr. Bailey, Decater Pepper, Ed Spencer, Mr. Thacher, Stewards: Thomas Blackwell, Alfred Blackwell, Hilton Leonard, Joseph Blackwell, David Rundell, F.L. Stanton, H. Spencer, C. Fanning, D.S. Bourne, Sloan Ross, William Heath, and M. Rockwell. Some of the committees remembered were. Lee Bourne, Horace Spencer, Isaac McKean and Thomas Brownson. Lee Bourne, Alfred Spencer, Elwyn McKean, and Thomas Brownson. Theodore Wrisley, Alfred Spencer, Elwyn McKean, and Thomas Case. Theodore Wrisley, Raymond McKean, Thomas Case. Winfield Bourne, Raymond McKean, and Ray Ballard. The present Committee is Robert Peters, Raymond McKean, Sheila Wendy Wrisley and Rowena Mingos Ward. “ Faith of our Fathers! living still in spite of dungeon, fire and sword; O how our hearts beat high with joy When-e’er we hear that glorious word! Faith of our Fathers, holy faith! We will be true to thee till death. Amen.